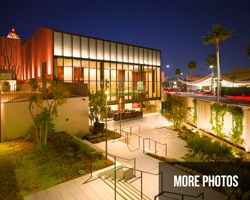 The 500-Seat Bram Goldsmith Theater is a new structure seamlessly connected to the historic building and is the centerpiece of The Wallis. 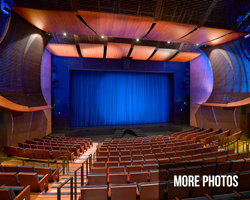 With 400 seats in the Orchestra and 100 seats in the Mezzanine the Theater is a perfect mid-size venue. The Goldsmith Theater features stunning American Walnut finishes, wide aisles and comfortable seating with royal blue upholstery, and excellent sightlines throughout the hall. The Goldsmith Theater has a 46’ X 24’ Proscenium and a 41’ deep stage with a full orchestra pit, dramatic royal blue stage curtain and houses a state-of-the-art digital projector and a 37’ movie screen. The Goldsmith Theater may be rented for events such as screenings, lectures, panels and meetings, subject to availability. The Lovelace Studio Theater is located in the historic building and was adapted from the original Mail Sorting Room of the Beverly Hills Post Office into a “black box” flexible theater space. 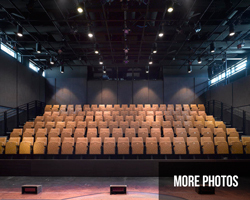 The Lovelace includes a 150-Seat retractable seating unit and a wooden stage floor. The Lovelace houses “The Sorting Room”, The Wallis’ seasonal intimate venue for performing artists as well as smaller productions and rehearsals throughout the Season. The venue does not currently house projection equipment. The Lovelace may be rented for panels, lectures, and meetings, subject to availability. The historic 1933 Italian Renaissance Revival style Grand Hall of the former Beverly Hills Post Office is 2,625 square feet and is the main entrance to the entire facility. 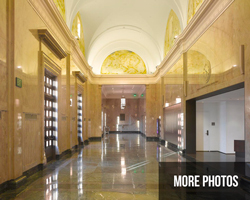 The Jim and Eleanor Randall Grand Hall features vaulted ceilings encasing rare WPA fresco murals and welcomes guests as they visit our Ticketing Services, GRoW @The Wallis: A Space for Arts Education, and the Briskin Bar. As the public main entrance to The Wallis campus, the Randall Grand Hall can accommodate up to 250 people standing or 100 people seated and may be rented for a reception or dinner subject to availability and other activity in the venue. The outdoor Promenade Terrace is 6,600 square feet and can accommodate up to 500 people for a seated dinner or up to 700 people standing depending on set-up and arrangement of rental equipment. The Promenade Terrace is connected to the sunken Jamie Tisch Sculpture Garden leading to the lobby of the Bram Goldsmith Theater. The Promenade Terrace can accommodate tenting and may be rented for a seated dinner or standing reception subject to availability and other activity in the venue. The outdoor Jamie Tisch Sculpture Garden is an elegant sunken garden leading into the Bram Goldsmith Theater Lobby. The Tisch Sculpture Garden features beautiful landscaping and water walls, art sculptures and the indoor/outdoor Nicholl Bar to service receptions and patrons attending events in the Bram Goldsmith Theater. The Tisch Sculpture Garden can accommodate 85 people or up to 200 in combination with the rental of the Bram Goldsmith Theater Lobby and may be rented for a standing reception subject to availability and other activity in the venue. The David Bohnett Foundation Founders Room is 965 square feet, beautifully decorated and designed as a lounge and meeting room to entertain The Wallis’ Donors and VIP’s. 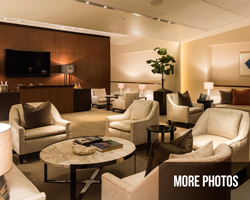 The Bohnett Founders Room features a bar, large TV Monitor, and permanent lounge seating for 18 provided by Meridith Baer Home. The Bohnett Founders Room can accommodate up to 50 people for a standing reception. 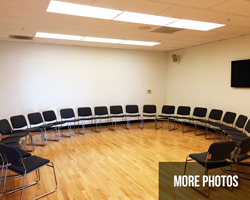 The Bohnett Founders Room may only be rented in conjunction with the Bram Goldsmith Theater rental and is subject to availability and other activity in the venue. 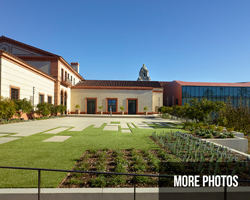 The outdoor Wells Family Education Courtyard, formerly the loading dock of the historic Beverly Hills Post Office, is 890 square feet and is part of The Wallis’ Education Wing housing GRoW @ The Wallis: A Space for Arts Education. 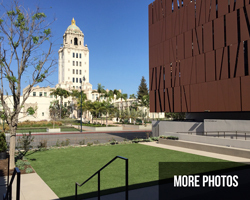 The Wells Family Education Courtyard is a fenced grassy courtyard facing Crescent Drive and the historic Beverly Hills City Hall. The Education Courtyard can accommodate approximately 100 people standing or 50 people seated and may be rented for an outdoor reception subject to availability and The Wallis’ educational activity in the Education Wing. The Wallis’ Grow @ The Wallis: A Space for Arts Education includes three 590 square foot Classrooms with wooden sprung floors, TV monitors and technical equipment for educational purposes. The Classrooms can accommodate 25 people each and may only be rented in conjunction with a Theater or Promenade Terrace rentaland is subject to availability and The Wallis’ educational activity in the Wing.